If you’ve ever wanted to ask for more money at work, you probably had the same worries my new client shared. You’d think we’d have this down by now, right? After all, people have been asking for more money at work for eons, maybe ever since Gorp asked Grawk for an extra bone from the dinosaur kill. So why, when there are a million tools and advice columns out there on negotiating salary and asking for what you deserve, do we still struggle? It’s that damn four-letter word, FEAR. Add fear to our weird lovehate feelings about money and work, and you have a cauldron of steaming confusion. 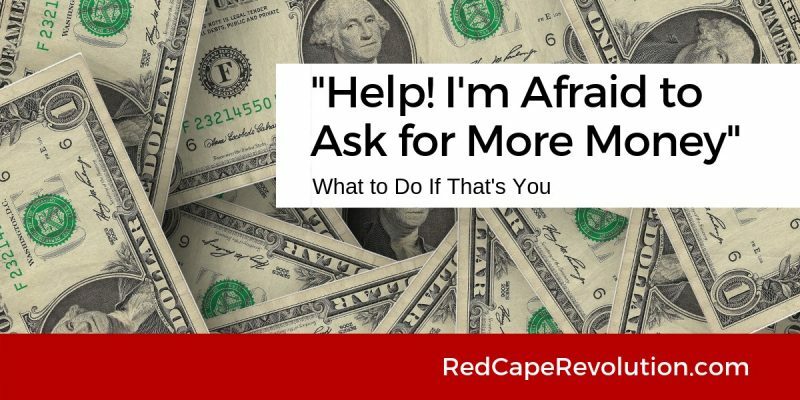 So let’s shine a light on the fears, and dive into a few strategies to fight that fear of asking for more money. Most people, no matter how outwardly confident we seem, worry that we’re not as good as we think we are. And our even bigger worry is that others will someday find out. This secret worry makes us afraid to ask for more money–or for almost anything. We’re not sure we’re worth it, deserve it, or have earned it. The antidote to fear is preparation. Yup, you’ve got to do your advance work if you want to ask for more money. But here’s what nobody’s telling you. This advance work is as much for YOU and YOUR BRAIN as it is to convince your boss or leader. You can’t have a successful conversation about money if you don’t believe you’re worth it first. Instead, rely more on people. Are there people who’ve left recently who you have a good relationship with? Ask them to test your salary assumptions. Note that you’re NOT asking them what they make (nor are you telling them what you currently make). You’re asking them for their opinion on the value of that role in the market.When you ask for opinion, you allow people to more safely express themselves, because opinion isn’t right or wrong. What if asking for more money wasn’t about you, but was about your commitment to maintaining the health of the business? What if, by asking for what you’re worth, you were simply being a great steward of what’s right for the business? Approaching this conversation with a business case mindset will help quiet your fears and battle the lizard brain that’s holding you back. Putting your salary in perspective with the bigger numbers makes a bigger number seem like a bargain. Plus, tying your increase to business financials makes it significantly easier for your boss to sell the change upward to her/his bosses. Here’s the truth: “no” is an acceptable answer. Plus, it’s worlds better than beating yourself up because you never asked at all. If, after a good, honest conversation, the answer is “no,” you’ll then have a clearer picture about your value in the company. To not be okay with it and begin to take action to create change, whether right inside your current company or elsewhere. Hear this: both options are possible. Remember, just because you ask for more money and hear “no” doesn’t mean you have to turn your back on a role that may benefit you in other ways. YOUR TURN: Something keeping you from asking for more money at work? Maybe it’s time to talk to a professional coach like me. I’ve helped successful professionals like you figure out what to do, say, and think so that you can finally start making changes you deserve. A 30-minute chat is completely confidential & free: get started here.